The Certification Commission offers two certification programs; one for practitioners who work with adults and transition age youth (age 16 and above), the CPRP, and one for practitioners serving children and youth (under age 18) and their families, the CFRP. The information below will guide you as you seek PRA certification. Individuals of all backgrounds can achieve a PRA Credential! A PRA credential verifies that you have met rigorous standards demonstrating your competence and dedication to the field, and to the promise of recovery! 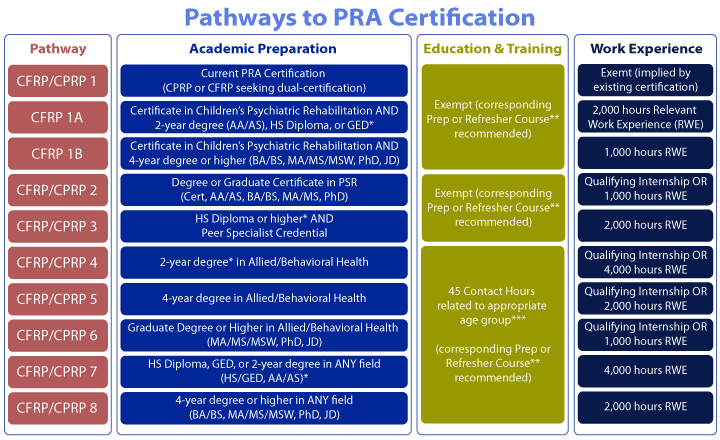 For those primarily serving Adults and/or Transition Age Youth (Over Age 16), PRA offers the Certified Psychiatric Rehabilitation Practitioner (CPRP) credential. For those primarily serving Children and Youth (Under Age 18), PRA offers the Child and Family Resiliency Practitioner (CFRP) credential. Current CPRPs and CFRPs vary from MDs, PhDs to GEDs, occupational therapists to peer specialists, social workers to caseworkers – all sharing a commitment to the fundamental principle that recovery from serious mental illness is possible. *As of February 2019, candidates may sit for a PRA Exam prior to meeting the Work Experience requirement. After passing the exam, candidates will be awarded their PRA Credential after demonstrating completion of the Work Experience requirement of their pathway. Nearly all candidates are required to complete 45 hours of applicable Education & Trainings, 4 hours of which must be specific to Ethics. All training must address the treatment and/or rehabilitation of serious mental illness within the appropriate population (CPRP: adults/transition-age youth over age 16; CFRP: children and youth under age 18). This includes topics on direct care, vocational or life skills training, crisis intervention, treatment modalities, medications, diversity, ethical/legal issues, etc. PLEASE NOTE: The certification exam application is only viewable to individuals who have a registered account on the PRA website. Please log in to see the product in the online store. The applicaiton may only be purchased by individuals. If you require assistance, please contact PRA. *Inclusion of Academic Preparation at GED, HS Diploma, and 2-year degree level (HS/GED, AA/AS): PRA believes that personal and/or working experience with mental illness yields practitioners who are well-prepared to provide psychiatric rehabilitation services. **The CPRP/CFRP Prep Courses (CFRP Prep Course coming in 2019) are designed to orient to the corresponding exam individuals who are new to the field of rehabilitation and recovery, have little work experience, or desire a comprehensive education on professional knowledge and skills. The CPRP/CFRP Refresher Courses (under development) are designed for individuals with extensive work history in the field of rehabilitation and recovery, and desire an overview of the key concepts, domains, skills and strategies, as well as an orientation to the corresponding exam. ***Contact hours must be completed within the past 36 months, directly relate to the corresponding practice domains (CPRP/CFRP), and address the treatment and/or rehabilitation of individuals with serious mental illness in the appropriate population (CPRP: adults/transition-age youth over age 16; CFRP: children and youth under age 18). Training may include topics on direct care, vocational or life skills training, crisis intervention, treatment modalities, medications, diversity, ethical/legal issues, etc. All training hours must be accumulated prior to submission of your application to sit for the exam. When calculating training hours, one contact hours is equivalent to 60 minutes of training. Best Practices in Psychiatric Rehabilitation is the #1 Study Tool Available: for all pathways and certification, it is highly recommended that prospective CPRPs and/or CFRPs obtain and refer to Best Practices in Psychiatric Rehabilitation, a PRA publication that will provide you with tools and resources to optimize the psychiatric rehabilitation services you provide. Relevant Work Experience: work experience must be in psychiatric rehabilitation/recovery-oriented environment serving the appropriate population (for CPRP: adults and/or transition-age youth age 16+ or higher; for CFRP: children and youth under age 18) with serious and persistent mental illness. Qualifying Internships: a qualifying internship includes a minimum of 400 supervised hours in a psychiatric rehabilitation environment where the supervisor is a current CPRP/CFRP in good standing (the credential corresponding to the credential you are pursuing). Qualifying Peer Specialist Credential: a qualifying peer specialist credential is defined as a certificate/certification program containing 45 or more hours of training directly related to the practice domains of psychiatric rehabilitation, as outlined on the CPRP Exam Blueprint and/or CFRP Exam Blueprint. If the CPS does not include a minimum of 45 training hours that relate to the 7 practice domains of psychiatric rehabilitation, additional training in the psych rehab practice domains is required to reach 45 hours of total education & training. Applicants are required to submit a copy of the course/program syllabus/outline along with a certificate of completion from the granting body/organization to demonstrate qualifying training hours. For purposes of PRA certification exam applications, training must address the treatment and/or rehabilitation of individuals with serious and persistent mental illness within the appropriate age group for the credential you are seeking (for CPRP: adults and/or transition-age youth age 16+ or higher; for CFRP: children and youth under age 18). Possible topics include direct care, vocational or life skills training, crisis intervention, treatment modalities, medications, diversity, ethical/legal issues, etc. Instruction on the use of treatment modalities in opposition to a recovery-based philosophy may not be used to fulfill the 45 hour requirement (e.g., use of restraints, involuntary commitment, forced medication, etc.). Certain related topics (infection control, medical complications, spectrum disorders, etc.) may also be acceptable if presented in the context of psychiatric rehabilitation practice. Qualifying hours of Education & Training must be in an Acceptable Format, and address Acceptable Topic(s). See below for more information. Activities sponsored by PRA-Approved Providers of Continuing Education (PRF's Academy of Psychiatric Rehabilitation and Recovery, most PRA Chapters and Affiliates, PSR Canada, and other designated organizations. Contact the activity sponsor to inquire about PRA Approved Provider status). Independent study, distance learning, online educational activities, or courses in psychiatric rehabilitation or mental health sponsored by an established/accredited academic institution or approved by the Certification Commission. Training in any of the various models of rehabilitation (clubhouse, lodge, case management, etc.). All training must address the treatment and/or rehabilitation of serious mental illness within the appropriate population (CPRP: adults/transition-age youth over age 16; CFRP: children and youth under age 18), and be relevant to the practice domains as outlined on the corresponding Exam Blueprint ( CPRP Exam Blueprint and/or CFRP Exam Blueprint). The topics below, while useful, do not address the practice domains identified for a PRA credential. Instruction on the use of treatment modalities in opposition to a recovery-based philosophy may not be used to fulfill the 45 hour requirement (e.g., use of restraints, involuntary commitment, forced medication, etc.). Some related topics listed below (infection control, medical complications, autism spectrum disorders, etc.) may be acceptable if presented in the context of psychiatric rehabilitation practice.